Volunteers using a driving simulator were monitored via standoff and wearable sensors, which recorded perspiration, heart rate, breathing rate, gaze and facial expressions to capture the drivers’ state as they were overloaded by multitasking. Distracted driving – texting or absent-mindedness – claims thousands of lives a year. 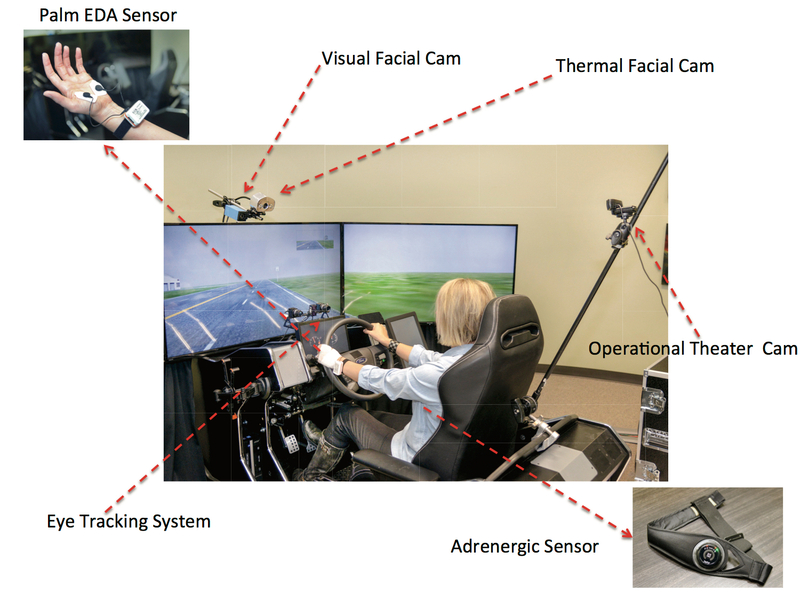 Researchers from the University of Houston and the Texas A&M Transportation Institute have produced an extensive dataset examining how drivers react to different types of distractions, part of an effort to devise strategies for making driving safer. In a paper published Aug. 15 in the current Scientific Data, the researchers make the dataset publicly available for the first time and describe how they collected the information. The study was conducted with 68 volunteers, all of whom had a valid driver’s license and normal or corrected-to-normal vision, on a driving simulator. Drivers were tracked with both thermal and visual cameras, along with palm sensors, sensors to measure heart rate and breathing rate, and an eye tracking system. Ioannis Pavlidis, Eckhard Pfeiffer Professor and director of the Computational Physiology Lab at UH, said the study is the first to tackle three types of distracting elements – sensorimotor, such as texting; cognitive, such as absorbing thoughts; and emotional distractions. Texting, the researchers found, led to far more dangerous driving, while a “sixth sense” appeared to protect those suffering emotional upset or absent-mindedness. Texting interfered with that sixth sense, letting drivers drift out of their traffic lanes. The researchers reported this result in the journal Scientific Reports last year, using a subset of the data they collected. Additional investigation showed that “eye tracking and breathing rate proved useful metrics for measuring the impact of texting while driving,” Pavlidis said. “But that wasn’t helpful in cases of emotional or cognitive distractions.” However, he said the researchers found heart rate signals captured via wearable sensors and perinasal perspiration captured via miniature thermal imagers were able to track all forms of distraction – a result that is reported in the current Scientific Data paper. That and other findings provide the groundwork for future safety systems, said Robert Wunderlich, director of the Center for Transportation Safety at the Texas A&M Transportation Institute. Given the widespread use of smart watches capable of measuring heart rate, he said this result opens the way for universal sensing of all forms of distraction at the consequential source, that is, the driver’s sympathetic system. The experiment worked like this: Volunteers drove the same segment of highway four times in a high-fidelity driving simulator – with no distraction and with cognitive, emotional and physical distraction. They were monitored via standoff and wearable sensors, which recorded perspiration, heart rate, breathing rate, gaze and facial expressions to capture the drivers’ state as they were overloaded by multitasking. At the same time, the simulator’s computer recorded driving performance variables including speed, acceleration, braking force, steering angle and lane position. The deluge of data such multimodal experiments produce requires sophisticated curation and complete openness, he said, not only for purposes of reproducibility but also as a means to investigate the dataset’s full potential. Citation: Taamneh, S. et al. A multimodal dataset for various forms of distracted driving. Sci. Data 4:170110 doi: 10.1038/sdata.2017.110 (2017). The full dataset is available at https://osf.io/c42cn/.